Code Innovation and SYNC Body-Brain Health released their eResilience Community app, a facilitator guide for the eResilience treatment protocol that helps war-affected communities recover from complex trauma. 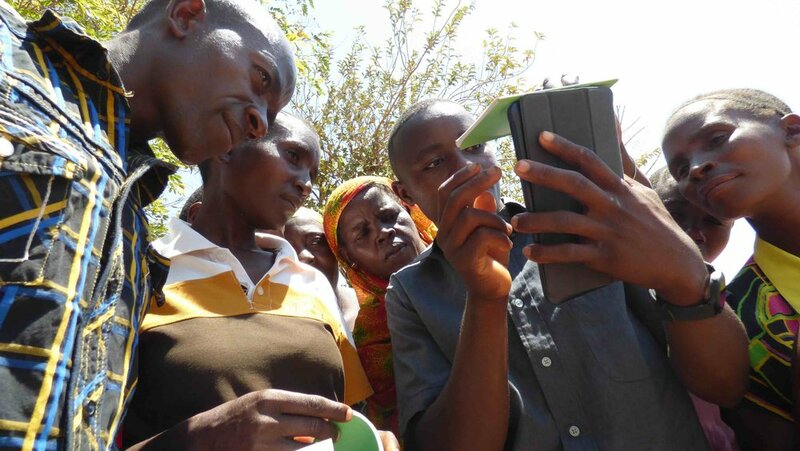 Project overview: In 2013, Code Innovation partnered with Tearfund Ethiopia and One Hen, Inc. to digitize a powerful development program called Self Help Groups (SHG), creating a free and open mobile resource in Swahili and Amharic to help these groups self-organize and self-advance. To date, the Self Help Group mobile app has reached over a thousand users with its curriculum and facilitation guide. For the next 18 months, we will be significantly building out the app, including new language versions, new thematic content and new features and functionality, so that it can be used by new global partners implementing SHGs and similar approaches. Contribute to the team’s day-to-day discussions and problem solving. During the last 6 months of the project, the Project Coordinator will train and supervise a Product Tester to assist her with quality assurance and app testing. Qualifications: We’re seeking a Project Coordinator who is engaged in using technology for social impact. As our product scales and attracts wider buy-in and support, we need a technical, detail-oriented Coordinator to keep track of all the moving pieces of a significantly complex build and to shepherd the SHG app through this exciting phase of development. Attention to detail is a must, combined with the ability to organize and maintain large, dynamic spreadsheets and databases. You will be working on your own schedule without close supervision, so you will need to show that you have experience working in this kind of open environment successfully. Because our partners are scattered around the globe, you must also be willing to join phone calls at awkward times of day, at least a couple times each month. International experience is highly relevant, particularly in the ICT4D sector. A track record of working in Sub-Saharan Africa is a big advantage. Experience training people in the use of complicated technology is also an advantage. There is room for growth within our organization, up into strategic and leadership positions. If you’re interested in development work and program design and in becoming more expert in any of the areas that we operate, please describe this ambition within your cover letter so that we see your motivation and growth potential. This is not a requirement by any means, as we will also have a steady supply of positions like this one. To apply: Please email your CV and cover letter to Elie Calhoun, Director of Operations at Code Innovations: elie@codeinnovation.com. Applications should be submitted by COB on 11 November 2016. Shortlisted candidates will be contacted by 18 November 2016. Strong candidates who respond quickly may be interviewed and accepted even quicker. Over the next few months, we’ll be profiling African tech hubs and innovation labs to highlight the strength and diversity of the ICT4D sector across the continent. We’ll interview our friends and colleagues here and ask them to share their stories about start-up, innovations and all things tech. Here, we interview Ken Mwenda – a co-founder and the Managing Director of eMobilis Mobile Training Academy in Nairobi, Kenya. Please share a bit about who you are and how you got started in tech. eMobilis is a software development training institution and incubation hub based in Nairobi, Kenya that has been in operation for the past five years. Our organization was founded at a time when Safaricom, the creator of Mpesa, overtook East African Breweries as the most profitable company in East Africa. That and the entry of four new telco’s into Kenya, marked the advent of a boom in the telecommunications sector and the dire need for talent to avoid the rampant poaching of network engineers and mobile product developers. When we opened our doors to students we were the first of our kind in Sub Saharan Africa. It was necessary to pioneer this kind of training to respond to digital opportunities in a focused way as no other colleges or universities were doing so at the time. From courses on network infrastructure, GSM, the evolution of 3G and radio propagation we then progressed to launch programs on Java, PHP, mySQL, HTML5, Android and Windows Phone as the industry evolved and it become clear that there were also phenomenal freelance and entrepreneurship opportunities presented in the exploding mobile software development space as a result of global app stores and the low barriers of entry for developers with a globally appealing software product. How did your organization get founded and how is it being run now? eMobilis was founded by 3 directors who pooled together capital and resources from personal savings. We set up in an area known as Westlands within Nairobi’s core and now have three fully equipped labs and an incubation room. Each of the three labs has a capacity of 30 students at any given time and part of our commitment to students is to offer high speed internet, high performance PC’s and a conducive environment for learning which includes test devices and a test server. It took us one and a half years to get government accreditation through the local Ministry of Education, Science and Technology. This rigorous process vetted our teaching staff, included inspecting our premises and also scrutinizing the curriculum. Typical courses run between one month and three months and all require creation of a mobile app as part of the hands on methodology. We also expose students to the publishing process and give them some ideas on how to monetize their skill. We also offer off-site Boot Camps and have partnered with top universities in Kenya to conduct certain trainings at their campuses. Over the years we have worked with University of Nairobi, JKUAT and Africa Nazarene to train their students in mobile programming. eMobilis has been engaged by both Google and Microsoft (Nokia) to conduct specialized training programs. In the case of Google it involved a series of workshops to assist small and medium sized businesses to set up their own websites using the GKBO (Getting Kenyan Businesses Online) tool. Our business model is multi-pronged. We run some programs where students pay full tuition while other programs are on full scholarship. For instance in the mlab East Africa program where the mandate was to grow and develop the mobile technology ecosystem, the best and brightest students were shortlisted competitively and given full scholarships for a four month training program. Many have gone on to form start-ups, some work on a freelance basis and another 60% have been absorbed into employment by banks, IT companies, small businesses and multinationals, typically in their IT departments. Funding from Infodev, a division of the World Bank enabled us to offer full, merit based scholarships at the mlab facility with our lecturers and curriculum. We seek out partnerships with corporate’s to offer custom tailored programs. One such partnership was with Nokia before they were bought out by Microsoft. Their goal was to promote local content on their devices through relevant and exciting mobile applications that helped them sell more phones. Nokia would fully fund a program for students which helped upskill and expose strong developers who create useful and appealing mobile applications. On the software development division we have worked with different international organizations including Code Innovation and One Hen Inc. to develop a ground breaking, multi-lingual mobile app that enables Facilitators of Self Help groups in Ethiopia to effectively learn and manage groups through mobile tools, resources and the app’s user friendly interface. Our model is also to seek out partnerships to create amazing apps for private as well as for not for profit organizations that want to leverage the power of mobile and to extend their reach and effectiveness with their customers or constituents. Do you work in open source? What is your experience with the open source community? We do. When we run programs on Android, HTML5 and others we build on curriculum and resources openly available through the open source community. We also direct our students to developer forums and communities so that they can contribute and also further their research as they code. There are numerous challenges, many of them that come with the territory when you decide to pioneer a concept as novel as mobile software development training in Africa. Code schools and academies are still fairly uncommon. In the early days there was very low awareness on this area of training. Traditional education and institutions did not teach mobile software development and so we had to spend heavily on marketing and awareness building so that potential students could get excited about the opportunities afforded by the mobile space and how they could learn through us. As a start-up we had cash flow issues and lack of bank financing as software related businesses in Kenya typically do not qualify for bank loans and are considered high risk. Expenses spanning rent, salaries, quality equipment and marketing proved quite high as we raced to ramp up and attract solid student numbers to cover operating costs. Being in the Education sector we also needed to get accredited by the Government and that took a great deal of time and effort to help the Quality Assurance department at the Ministry of Education, Science and Technology understand our curriculum, process and the outcomes of the training. This was long and rigorous but important to us since as an organization we wanted to be compliant and to be able to assure parents and students about the quality and value of what we offer. Additionally there was the challenge of both finding highly qualified and passionate lecturers who understood this relatively new field, had developed their own apps and could communicate effectively to train students and motivate them as developers. What are your organization’s specific areas of expertise? What are the issues or problems that you care most about? - Solving the unacceptably high rate of unemployment in Kenya which stands at 40%. - Ensuring that globalization does not leave our youth behind as the world rapidly goes digital and we lose out on opportunities for work. - Facilitating creativity and unleashing the potential of our youth to innovate. - To establish Kenya as a hub of excellence for software development globally and to ensure we train top notch talent. - Building the tech ecosystem including attracting venture capitalists to invest in African start-ups to solve the funding issue and to provide mentorship. - Growing as an organization and escalating our impact. What projects are you most excited to be working on? Mobile software development projects with partners who can pilot, who have the reach and ability to roll out our mobile apps across Africa and have the desire to collaborate with us to iterate and grow together on various projects with proven social impact potential. What are your plans for the next few years and what sort of help do you need to achieve them? - To open 4 more centers with fully equipped labs across Kenya. - To form 10 key partnerships with mobile value added services companies. - To hire 2 dedicated staff for business development and to secure software projects. - To expand the range of programs and courses that we offer as technology evolves. - To work on 8 innovative and meaningful mobile app projects by Dec 2016. - To secure a $ 70,000 grant to allow us to offer scholarships to approximately 100 bright youth from East Africa over the next 12 months. - To hire for an Alumni and Jobs Manager to strengthen our job placement office. What companies or organizations would do you most like to be connected to and why? We would like to be connected to organizations that fund scholarships and those that want to outsource software development work and are willing to form a partnership either for knowledge transfer or collaborative social impact projects. We would also like to connect to Singularity, Stanford and MIT for exchange programs and teaching partnerships.